I am the mother to a wonderful 9 year old son who I homeschooled up until grade 3. I have my ECE certificate and many years nanny experience. I have no issues cleaning, doing laundry, organizing, meal prep/grocery shopping, running errands, picking up and dropping off kids. 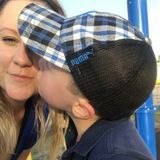 I recently relocated from Calgary and was a nanny there until the end of July. I look forward to speaking with you. Loving and reliable nanny available in Victoria for evenings and weekends. Energetic sitter who loves pets and the outdoors! I am a university student with a love for caring for kids and animals, looking lend a hand to families in the Victoria area.